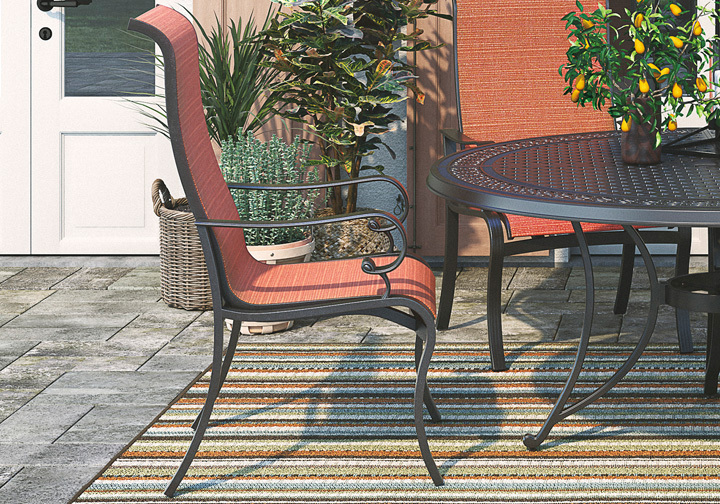 Embrace the alfresco life with the Apple Town sling dining chair. You’ll love sipping a beverage on the supportive sling seat. Burnt orange hue has an earthy look. Top of the back slightly curves for an air of sophistication. Frame won’t rust, leaving you free to enjoy the outdoors on this chair as long as you please. *Table and two chairs shown in image not included. 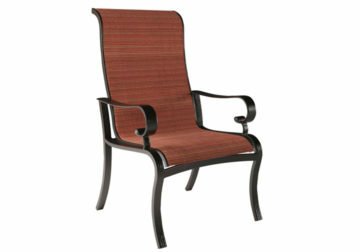 Rust free aluminum with sling fabric. Choose from high back dining and swivel rocker chairs or swivel bar stool. Choose from 4 dining table sizes: 48” and 60” round, 84” x 42” rectangular and 90” extension table. 48” round bar height table available. For all tables, see sku numbers from P456 and P557 collection. Use P557-706 end table for 3 piece small space set. Assembly required. Coordinate with P000-994 11ft auto-tilt umbrella. All tables can be found in P456 and P557 group series.